Iwaneyama Tsutsuji Garden (岩根山つつじ園, iwaneyamatsutsujien) is flower garden located in Nagatoro, Saitama. It has over 1,000 Tsutsuji (Rhododendron) trees in this garden, and in the beginning of April they bloom beautiful purple flowers. When all flowers bloom, entire mountain will be colored by deep purple. Also, there are some Cherry Blossom which bloom almost the same time. Original Tsutsuji trees are planted in Sengoku period (450 years ago). Now, you can enjoy great flower tunnel in this garden. Sakura is not only flower which bloom in spring in Japan. Check out Tsutsuji at Iwaneyama Tsutsuji Garden. 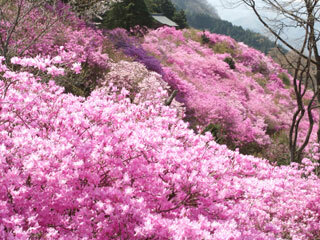 Thousands of Tsutsuji trees bloom beautiful purple flowers which covers entire mountain. It gives you excellent landscape from both top of the hill or bottom, and also all the hiking courses in the flower garden becomes beautiful flower tunnel. There are also other beautiful flowers which blooms almost the same time, such as Yama-zakura, Someiyoshino, Shidare-zakura, Tubaki, and Fuji. Some of the Tsutsuji trees are planted by Isobe Family who was one of samurai of Shingen Takeda. Also, many of Tsutsuji are planted about 100 years ago. Definitely, one of the must see spot around Chichibu in Spring.